I’ve included this recipe because it brings back a lot of memories. Gem scones are a cross between a scone and a muffin, but sadly impossible to cook unless you have a gem iron, which I don’t think you can buy these days. My cast iron gem iron was made for me by a friend of Mum & Dad’s, when he made one for Mum. The secret of cooking them is to get the iron super hot so that the mixture sizzles when you drop it in. They taste great and finding this recipe now makes me want to cook a batch again. 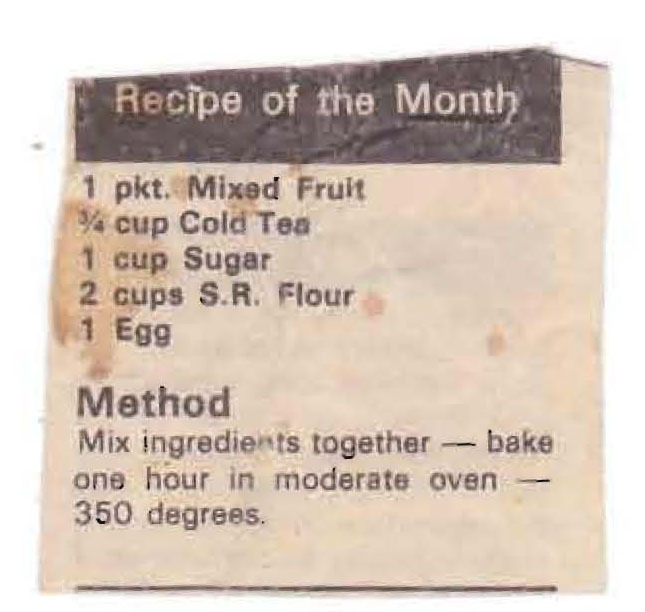 I’ve been watching contestants on recent cooking shows struggling to successfully make doughnuts and thinking that it was a new dessert, that is until I found this old recipe in Mum’s collection. 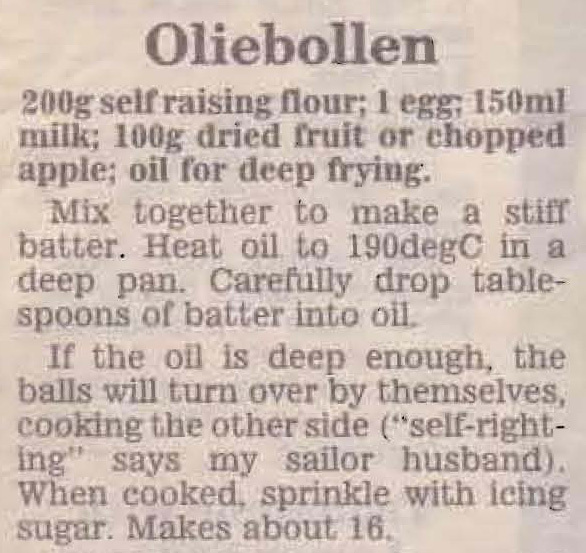 It made me look up the meaning of Oliebollen and Wikipedia describes them as “a traditional Dutch and Belgian food. They are called oliebollen in the Netherlands, while in Belgium they are also called smoutebollen and croustillons in French. In English they are more commonly known as Dutch Doughnuts or Dutchies.” Whatever the name they taste great, just hope you have more success with them than some of the contestants. I don’t remember Mum making these, but she used to make sweet corn patties which were always one of my favourites. 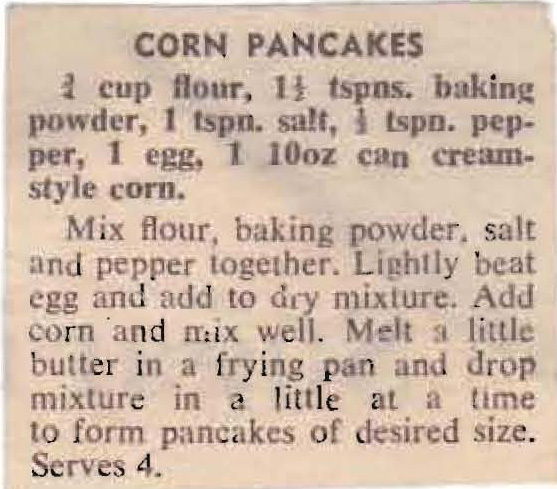 For those she used sweet corn kernels, for these pancakes you use creamed corn so you’d get a smoother mixture. I think I’ll give them a try, they sound good. Convert -10oz can to 310g size. Here’s another recipe from the Pampas Pastry Finger Food Recipe sheet. I can imagine a glass of bubbly in one hand and one of these in the other – a great way to start a party off I reckon. To be honest I can’t decide if this recipe would taste great or not. 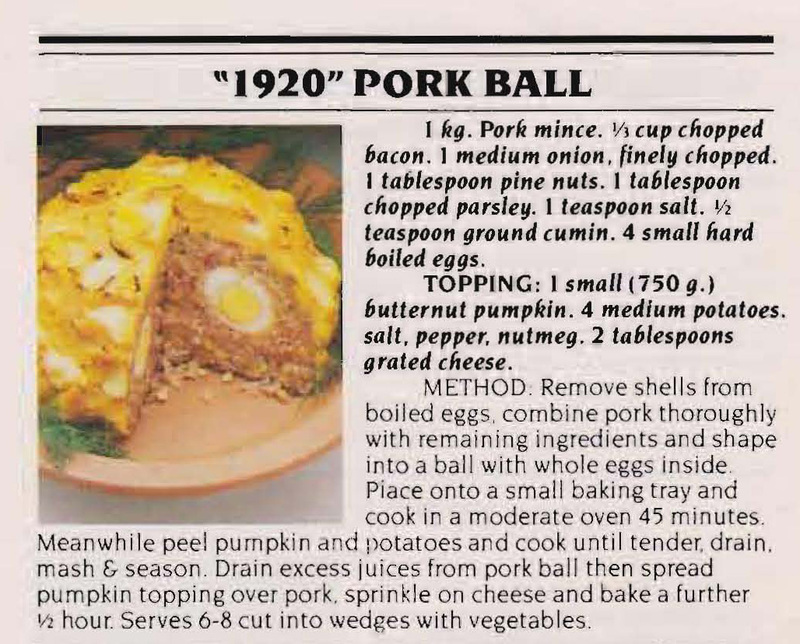 The pork mince, bacon, egg, pine nut filling sounds good, but the pumpkin and potato topping could make it stodgy. Mum must have thought it sounded alright or she wouldn’t have kept it, if you try it out let me know how it goes. If you don’t like dates substituting dried apricots in this recipe is a great idea. Served up buttered for morning or afternoon tea it’s always well received. The first Christmas cake I made was a total disaster. When I cut into it I discovered that it was still raw in the middle and totally inedible. I’d only been married a few months so of course the first thing I did was ring my Mum to find out what could be salvaged. Mum calmly told me not to panic, to put the cake in a mixing bowl, squash it all up and then pour in a cup of cold tea. Once it was all mixed through to then put it in a pudding bowl and cook it like a Christmas pudding and lo and behold it worked. 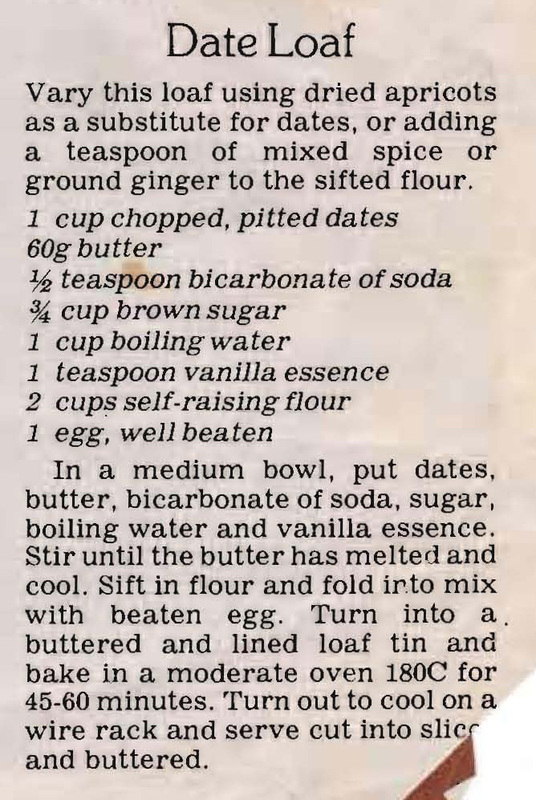 When I found this old recipe in Mum’s collection it reminded me so much of that cake/pudding disaster. I’ve always thought it was a marvellous trick that Mum knew and I think this old Fruit Loaf recipe gives a hint of where she got the idea from.